Installing a new lawn in a house that has little more than some dusty dirt? Moving into a new home that has a lawn that leaves quite a bit to be desired? Sod installation in Boerne is a common task, especially when people move into a new home – and it makes quite the difference. Our professional landscaping contractors can help you with this, making your lawn instantly beautiful and ensuring that the sod takes. As always, our work is completed promptly and professionally. When you can't find any time to seed, water, and wait for a thicker, fuller, more beautiful lawn to grow into your yard, then this service is one of the best ways to get your lawn looking better instantly. Our professional Boerne Landscaping Pros. will help you eliminate your old lawn and prepare the ground for the sod installation. Then, we can repair any problematic areas and renovate the substrate, or underlying layer of dirt. Eventually, we will lay new sod in your yard. 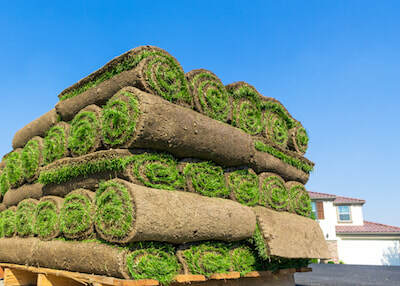 Our sod takes to your yard so much faster because of all the prep work that we do – you’ll be able to walk, play, dance, practice yoga, or do whatever else you want on your yard. There are so many different reasons that someone might want sod installation for their home. One of the most common reasons is because someone wants to sell their home, and the curb appeal of the home doesn’t match the inside. If it is making your Boerne home difficult to sell, investing in this might help you. Sod installation can also make it easier for you to enjoy your yard and make memories. If you have children that run around and play, you want something that is lusher. Having a beautiful lawn is a priority for people and Boerne Landscaping Pros understands how much it means to you – we see it every day. That is why we work hard to learn all that we can and provide for the citizens of Boerne. This is just a part of that. Call us today and we will start working with you on this service. Another reason people install sod is because they need full, lush grass for an event they are having – a wedding reception, graduation party, cookout, prom photos, or another special event. If you want to plant new sod, it is far more beneficial to do that rather than grow grass from seeds. Seeding can take quite a bit more time, and sometimes it can take many months if the weather doesn’t agree with you. Hydro seeding can be a great idea, but there tends to be difficulty with erosion of the top soil and other problems. If you need a lawn to grow quickly, sod is absolutely the best way to do it. With sod, there is some waiting as well – you have to wait for the roots to establish themselves. You want to look into sod installation in advance if you are having an event where there will be a lot of foot traffic. It is important to note that sod is a great idea for yards where seeds struggle to thrive – on hillsides, near water, around landscaping, and for yards that have pets. Sometimes this can make installation difficult, but we can cut our sod so that it moves perfectly around all the features of your yard. When you talk to us, we will give you an honest assertion of which will be best for your yard and your budget. We will try to give you the pros and cons as we see them with your yard – including the amount of maintenance and follow up work that you need. Sod is a labor of love, but it is well worth it when you are trying to give yourself the greenest grass possible. 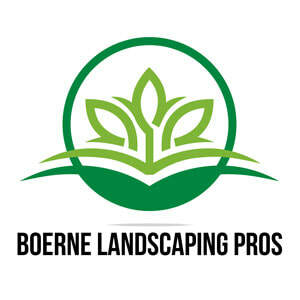 Our landscaping professionals at Boerne Landscaping Pros. 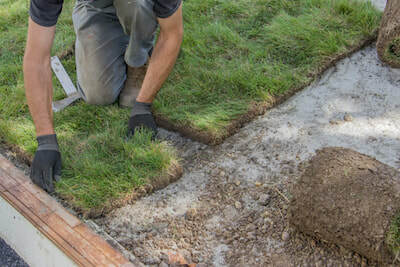 can help you to decide when, where, and how to install sod in your yard. Once we have established this, we will take it from there, from sourcing the sod to installation. 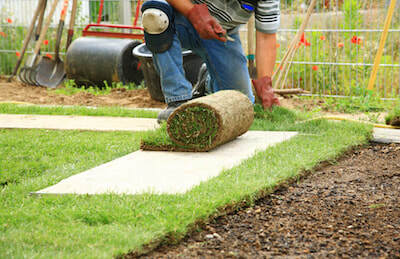 From there, we can help you to maintain it and ensure that the sod slabs take to your yard. Give us a call today to ensure that you have the best team in Boerne.